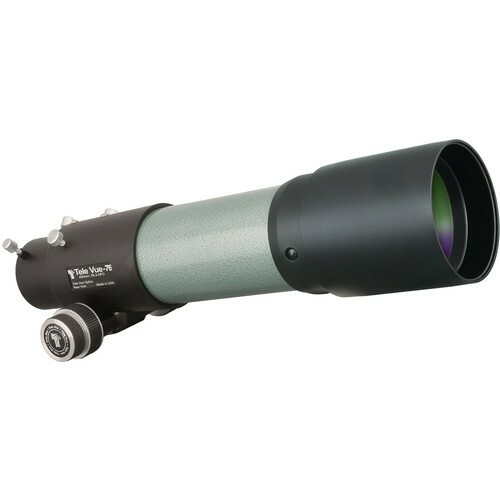 Ideally suited for astronomy and astrophotography, the green Tele Vue TV-76 76mm f/6 APO Doublet Refractor Telescope is designed to be an easy grab-and-go option for celestial observing, or a lightweight spotting scope alternative for birdwatching and other terrestrial uses. It employs Japanese-made optical glass set in an apochromatic doublet lens configuration, designed to Al Nagler's exacting standards, to produce flat views with accurate color fidelity and improved contrast, without fringing or halos. Complementing the lens design, are broadband fully multi-coated optics that are specifically index matched to the lens glass to maximize light transmission across the entire visual spectrum and to ensure accurate color rendition, improved contrast, and clarity. A large 2" dual-speed focuser is used to bring lunar details, planetary features, or distant objects into tack-sharp resolution. Tele Vue offers this TV-76 stripped of accessories and without a mount or tripod for users who have their own equipment and support systems and who are looking to add a competent, yet portable, optical tube assembly to their kit, or for those who wish to build a completely custom rig. Exterior dimensions (excluding handles and strap): 20 x 9 x 6"